INDIANA, United States- A woman accused of being the leader of a human trafficking and prostitution ring believed to have connections to Richmond is expected to have her bail hearing completed this afternoon. Yong Williams, 50, will have her bail hearing continued in the U.S. District Court in Covington, Ky., a court clerk said this morning. 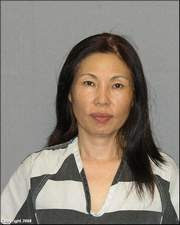 The clerk said Williams was in court at 8:30 a.m. along with 63-year-old Myong Rogers. Rogers is charged with accepting customers' credit cards to pay for prostitution.Williams admitted to undercover agents this week that she drove 40,000 miles in seven months delivering Korean women to massage parlors that are believed to have offered sexual services, according to The Cincinnati Enquirer and NKY.com, a northern Kentucky Web site. Williams acted as a “bank” by collecting, holding and distributing money to and from the owners of the massage parlors across the nation, including parlors in the region, according to court documents.